LOS ANGELES - In full retirement at the age of 37, Pete Sampras graced the Los Angeles Tennis Center with a special exhibition match against Russian Marat Safin. 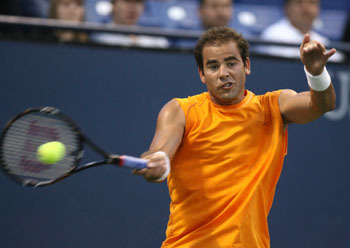 Sampras was this year's honoree of the tournament. The fans in the filled stadium had the opportunity to experience a favorite hero play again. Safin took the first set but Sampras threw in some aces mixed with his serve and volley style to take the second set. Safin turned it up a notch and started passing down the line to win the tie-break third set. Sampras won this tournament in 1991 and 1999. It was a memorable evening which included a video tribute to the legendary Pete Sampras. His parents, siblings, and wife, Bridget Wilson with their two boys (Christian 6, Ryan 3), joined him on center court as he accepted his award. In the pre-match interview he spoke of wanting to break Roy Emerson's record. He reached that goal with 14 Grand Slam titles (Emerson had 12.) "Records are meant to be broken," he said when asked how he felt about Roger Federer surpassing his record earlier this month at Wimbledon. He appeared comfortable with all that he accomplished. His career lasted from 1988 to 2002. He won two Australian Opens, seven Wimbledons, and five US Open Championships. "I would need a time capsule," Sampras said. He felt he had the game to beat Federer if he could have played him in his prime. Seven years into his retirement, he still has a phenomenal serve and his crowd-pleasing jumping overhead slam. It was a brilliant idea to bring back Pete Sampras not just as an honoree but as a featured evening match. Both the older fans and the younger kids were able to see Pistol Pete in action.